When Jesus had crossed over again to the other side, a large crowd thronged around him as he stood on the shore. When one of the rulers of the synagogue, a man called Jairus, saw Jesus, he threw himself at his feet. ‘My little daughter is dying. Come and lay your hands on her so that she can be healed and live,’ he begged. So Jesus went with him. While he was speaking to her, some people came from the ruler of the synagogue’s house and said, ‘Your daughter has died; why bother the teacher any more?’ Jesus overheard, and he said to the ruler of the synagogue, ‘Don’t be afraid. Just have faith.’ He allowed no one to accompany him except Peter, James, and James’ brother John. They went into the house of the synagogue ruler, and he saw a great commotion, people crying and wailing. Going inside he said to them, ‘Why are you weeping and making such a racket. The little girl is not dead; she’s asleep.’ They laughed at him, but he threw them all out and taking the child’s mother and father along with his companions he went in to the child’s room. Holding her hand, he said to her, ‘Talitha koum,’ which means ‘Little girl, I’m telling you to wake up!’ The girl got up immediately and started walking around. She was twelve years old. And they were overcome with astonishment, but Jesus ordered them all to keep quiet about it, and he told them to give the child something to eat. One day, he decided he would go to the forest to find the wise man who lived there and ask him if his luck would ever change and if he would ever become rich. He hadn’t gone very far before he met a scrawny-looking wolf lying by the side of the path. ‘Where are you going?’ asked the wolf. ‘Yes, I’ll ask him,’ replied Shaydoola, as he went on his way. A little further along Shaydoola came upon an apple-tree, but even though it was summer time there were no apples on the tree. ‘Where are you going?’ asked the tree. ‘I’m going to find the Wise Man of the Forest, to ask him if I’ll ever be rich. I don’t want to work, I just want to enjoy myself,’ said Shaydoola. ‘Yes, I’ll ask him,’ replied Shaydoola, as he hurried on. Nearing the end of his journey, Shaydoola came to a river, and he had no alternative but to swim across. Half way over, a big fish approached him. ‘Where are you going?’ it croaked in a barely audible voice. ‘I’ll see what I can do,’ replied Shaydoola as he pulled himself out of the water and on to the river bank. It wasn’t long before he came to a clearing in the forest where the wise man lived. ‘Why have you come to see me, Shaydoola?’ asked the Wise Man of the Forest. ‘Tell the fish that there is a huge diamond stuck in its throat. It needs someone to reach inside and pull it out; then the fish will be able to talk without any pain. Someone has buried a treasure chest underneath the apple-tree and this is interfering with the tree’s roots. If someone were to dig the treasure up the tree would start producing apples again. And if the wolf were to eat the next lazy fool who passes by she would start to regain her strength,’ said the Wise Man of the Forest. ‘Go on your way Shaydoola. What must be must be!’ replied the Wise Man of the Forest enigmatically. Eventually he came to the miserable looking wolf. ‘Did you ask the Wise Man of the Forest about me?’ she asked. ‘Yes I did,’ replied Shaydoola. ‘He said that you had to eat the next lazy fool who comes along and then you’ll start to become strong again,’ said Shaydoola. Mustering all her remaining strength, the wolf did as he had been advised and she gobbled up Shaydoola. And so indeed, it was just as the Wise Man of the Forest had said. What must be must be. The story I wanted to tell the children this morning is the story of the world’s politest man. It’s the very first story in my book The Shortest Distance, and so I thought that they – and you - would all be familiar with it. But for those who aren’t, or who have forgotten, let me refresh your memory. It takes place in the City of Fools, where a lecture is to be delivered by the politest man in the world. He is to talk about the importance of politeness, the development of etiquette, and how he gained the prestigious title of The World’s Politest Man. This story comes from the Sufis – Islam’s mystics – and, like so many Sufi stories, it seems like a joke. But it makes an extremely serious point – as does the story of Shaydoola, which I actually did tell the children. The City of Fools is everywhere. It’s where human beings live. And we are fools because we can’t read the signs. We are oblivious to the very simple and obvious messages that are presented to us daily, but we are so immersed in the irrelevant minutiae of life that we constantly miss them. It’s as though we are half asleep. In fact, one of the clearest and most emphasised teachings of the world’s spiritual traditions is precisely this: we are asleep. Even the busiest and most energetic among us is walking in his sleep; indeed, it is one of the paradoxes of the spiritual life, that those who seem to be the most active are often the sleepiest of all. Expressions like, ‘24/7’, ‘work hard, play hard’, ‘burning the candle at both ends’ – expressions which one may be encouraged to use in a job interview just to impress potential employers – are clear indicators of people who are asleep. Another sure sign is the human being’s apparent willingness to surrender control of his or her life and thought to inherited and largely unexamined belief systems – secular and religious – which ensures that we think, act, speak, and aspire within narrow, culturally sanctioned parameters. It’s also emphatically taught by our spiritual mentors that unless we do something about our sleepiness we’ll never even begin to sort out our problems. This is what distinguishes the spiritual approach to life from the purely secular, political one. The political and economic solutions to human problems from right and left suggest that by increasing our gross national product, redistributing wealth, making serious noises about peace, increasing education, making life more comfortable, we will contribute substantially to the sum of human happiness. The ambiguous results of that approach are everywhere in evidence around us. There is probably as much war now as there has ever been. Slavery, outlawed by Britain 200 years ago, is as prevalent now as it was in days gone by; we may have got rid of child labour and sweatshops in the developed West, but we’ve simply removed them to China and India where they no longer offend our delicate sensibilities. Prosperity brings its own problems, as does peace. In Shakespeare’s Coriolanus, in one of those short scenes which we tend to ignore, two minor characters – ‘Servingmen’ – are discussing the relative merits of war and peace. One says, ‘Let me have war, say I; it exceeds peace as far as day does night; it’s sprightly, waking, audible, and full of vent. Peace is a very apoplexy, lethargy, mulled, deaf, sleepy, insensible.....’ ‘Aye, and it makes men hate one another,’ says a second. And why, ‘Because they then less need one another,’ says a third. Why are there wars? These minor characters in Shakespeare know very well that it’s because in some way, deep down, in our unawakened state, we actually like them. Happiness has not kept pace with material advances in the developed world – recent surveys suggest that British people are no happier now than they were in the fifties, and the 31 million prescriptions for antidepressants issued in Britain in 2006 would seem to support this conclusion. Why are these things so? Because economic and political agendas are, according to the human race’s spiritual teachers, merely cosmetic attempts to solve a much more radical problem. And the radical problem is that the vast majority of the human race is asleep, lulled into slumber by numerous cultural soporifics which effortlessly seem to discourage us from behaving, thinking, or speaking with any measure of depth or originality. To quote the Hindu sage Krishnamurti, many of our earnest political efforts are ineffective simply because they are devoted to ‘decorating the prison walls’. Jesus puts it simply, too. ‘Seek ye first the kingdom of God,’ he says, ‘and everything else will be given to you.’ And where or what is the kingdom of God? Well, it’s certainly not some imaginary economic utopia brought into existence by a political saviour, either divine or human. It’s the awakened, enlightened state. When we reach it – or when a significant number of people reach it – our political and economic problems will take care of themselves. ‘Awakening’ is central to all forms of Buddhism, which postulates that each of us has a Buddha nature, buried deep within, which needs to be aroused. 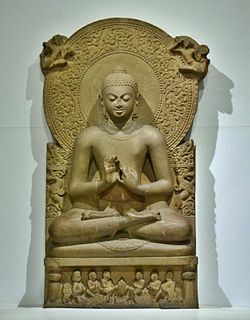 Buddhists tell the story of how the Buddha himself was questioned by some seekers after truth. ‘Are you a god,’ they asked him. ‘Well, what are you which makes you so different from the rest of us? The word ‘Buddha’ simply means, ‘one who is awake’. Buddha-hood is a state of consciousness potentially attainable by us all. Gautama – the one we call ‘The Buddha’ - is just one of many who have attained this exalted state. Moral reform is the effort to throw off sleep.......... The millions are awake enough for physical labour, but only one in a million is awake enough for effective intellectual exertion, only one in a hundred millions to a poetic or divine life. To be awake is to be alive. I have never yet met a man who was quite awake. How could I have looked him in the face? We must learn to reawaken and keep ourselves awake, not by mechanical aids, but by an infinite expectation of the dawn, which does not forsake us in our soundest sleep. The Christian stories also warn us of the dangers of sleep. Two stories in this third section of Mark’s Gospel – what I call the Gemini section – are concerned with awakening. Why should they occur here? One reason is that Gemini represents the lively, butterfly mind of the intellectually curious and the perennially busy; people who are strongly Geminian are constantly active, nervously restless, betraying that very busy-ness which is often a counterfeit of genuine alertness; the externally hectic life is frequently a sign of interior turmoil. In addition, as we said last week, Gemini is associated with lack of focus, fragmentation, splitting within the psyche, from which we are all in differing measure suffering, but of which most of us are blissfully unaware. 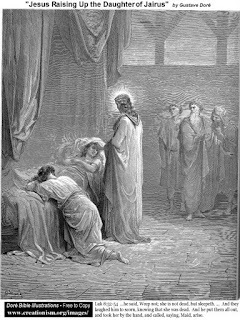 The first of the Gospel’s ‘sleep’ stories occurs right at the beginning of the section, at the end of chapter four. It’s the account of the Stilling of the Storm. The Geminian elements within this story are so numerous that I won’t even try to list them. Suffice it to say that the twin stars of the constellation Gemini were considered the patrons of seafarers in the ancient world, and mariners would pray to these gods when they were in distress. Mark is capitalising upon his reader’s ability to make this connection; but, of course, he is doing more than this. He is showing how.........well..........think about it for yourself. You don’t need me to spell it out for you! 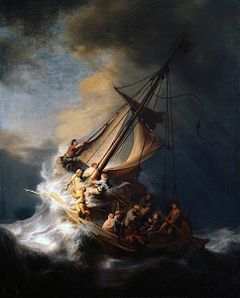 Ask yourself, who or what is the ‘master’ who is sleeping in the stern of the boat? Is it the historical Jesus of 2000 years ago? Is it the heavenly Jesus of much Christian preaching today? Or is it a power which lies deep within your own psyche which can be roused and which can help to calm your own life’s turbulence? 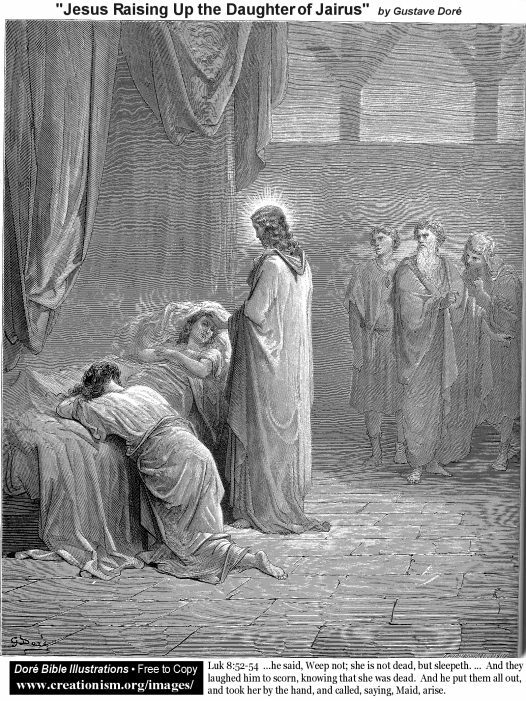 The second story is the story of Jairus’ Daughter. The first thing to notice about this story is the strange way in which it is told: it is the only miracle story in the Gospels which is broken into by another miracle story, the story of the Woman with the Flow of Blood. Two stories told together, a clear indication of Gemini. Mark (or whatever he or she was called) was so clever! This Gospel, which is almost universally considered to be the least sophisticated of the four Gospels, is actually a masterpiece of construction. However, more pertinent to our present purposes, the story introduces us to Jairus, whose name means ‘Jehovah Enlightens’. This should make us think. Names are never accidental in Mark; whenever someone is given a proper name, it is significant, as we shall see on other occasions. Jairus is the ‘ruler of the synagogue’, so he is an important figure within he Jewish community, and his daughter is moribund. Indeed, as the story proceeds, we learn that she is dead. But Jesus goes into the girl’s room, takes her by the hand, and says, ‘Talitha Koumi’, an Aramaic phrase which means, ‘Little girl, I’m telling you to wake up!’ The girl duly awakes, and Jesus tells her parents to give her something to eat. This story is conventionally interpreted as yet another miracle story, another incident which demonstrates the amazing power of Jesus, but such an interpretation generates numerous problems, especially in these sceptical times. But what is a problem to the intellect is a delight to the imagination. Let your imagination play with the story and what does it yield? Mine yields this: the daughter of the synagogue ruler is dying, maybe she’s dead already. Judaism, represented by Jairus, is in danger of losing its soul, its ‘feminine’, intuitive side. It is controlled by ‘masculine’ laws, rules, and regulations which are strangling the life out of it. The feminine needs to be revived, and needs to be fed if Judaism is to be a source of spiritual nurture to the people. Jesus uses the Aramaic phrase ‘Talitha koumi’, not as some have sentimentally proposed because Peter or some other figure was remembering the actual words of Jesus, but because the author of the Gospel wants to emphasise them. What he’s saying is, ‘I’m putting these words in a different language to draw your attention to them. This message is to everyone: ‘Wake up!’ As we shall see, Mark does the same thing in the next section of the Gospel. When we awake, what then? Ralph Waldo Emerson says, ‘When the torpid heart awakes it will revolutionise the world....(it) will give new senses, new wisdom of its own kind; that is, not more facts, nor new combinations, but....direct intuition of men and things.’ (The Preacher) Awakening the ‘torpid heart’ – not filling our heads with metaphysical gunk - is the function of all true religion. We are here to help one another to wake up. Waking up the feminine, intuitive, poetic side of the psyche, the side that has been dormant for so long, which has been outlawed and suppressed for so long, is the urgent religious task of our time, as it was the urgent task of Jesus’ time. When we rouse it from slumber we will gain a comprehensive, rounded and complete response to life. It will transform the City of Fools into the City of God. Gemini (3) How do we wake up?